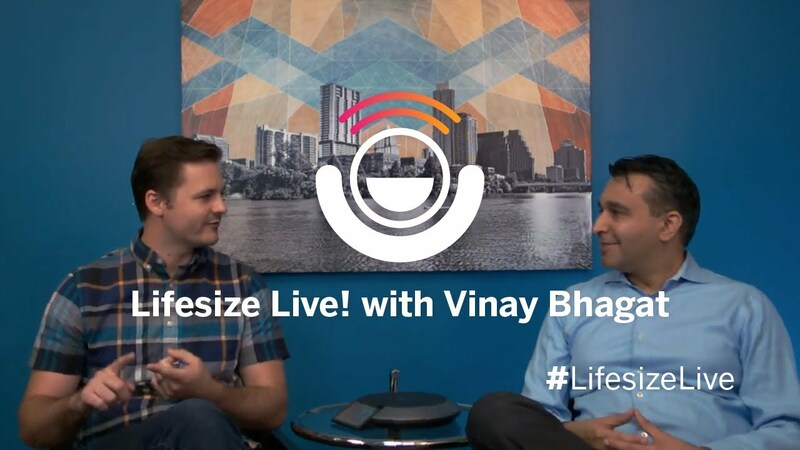 Hello, everybody, and welcome to Lifesize Live! It's the live show produced entirely through the Lifesize platform. I'm your host, Julian Fields, and with me today we've got Vinay Bhagat, the CEO of TrustRadius, and we're talking about the power of authentic customer voice in marketing. Vinay, welcome to the show. So, Vinay, tell me about your background and maybe a little bit about TrustRadius. Okay. Well, I'm a serial entrepreneur. I previously founded a company called Convio that helped charities use the Internet for communications and fund-raising. And today my company is TrustRadius, but the idea for TrustRadius was actually born through building my first company. As we scaled our business to about 450 people, we bought a lot of technology, including Lifesize. And along that journey, oftentimes there was a struggle to make good technology decisions. We never felt that we were entering a relationship with our eyes fully wide open. Occasionally, we would make mistakes and have to switch those products out. And so, the question was, “Are we that behind in technology, or does everybody struggle with this problem?” So I started to speak to other tech leaders around Austin and realized that this was a pervasive need, not just something that we felt. Now, around that time, my company was getting acquired, so I started to think about what was next for me. And I was buying a gift for my wife, a cappuccino machine. I walked into Williams-Sonoma and the sales guy tried to sell me one of the products they had in the store, but I just didn't quite trust the advice I was getting. You read all the boxes, turned them all around, and read the specs. And I talked to a friend who recommended a particular product, but before I bought it, I wanted to do some kind of research. So I Googled it, found some pretty good reviews on Amazon and Costco, but then found this site called coffeegeeks.com that had amazing reviews of these home cappuccino machines. So, I was like, “Why does something like a home appliance get all of this excruciating detail about what it's like to operate a machine — how to clean it, how to maintain it, if you have to send it back for repair — yet when I bought a piece of technology that cost $100,000 to run my business, I couldn’t find literally anything?” And the comparison was so stark for me, and that's where the idea of TrustRadius was born. Absolutely. That’s interesting. So, peer to peer, how do you even go about getting that type of information out there? So, you know, for the first couple of years of the company, the problem that we had to solve was getting people to go on the record and write reviews. Just to be clear, we're a customer review platform that uses reviews as the way to have customers express their experience with the products or brand. We operate a site used by about 300,000 users every month who Google tech products that they're looking to buy and then visit TrustRadius to do their research, but we also partner with brands to help them use reviews as a way to get authentic customer feedback. And the way that we develop reviews is really two-fold — one is by using our own community, people who use TrustRadius find value in it and want to give back to the community and write reviews. We've got some prolific reviewers now who've written more than 15 reviews. They’re mavens in terms of their use of technology. We’re constantly trying to find people outside of the community and invite them in as well. We also work with companies like yourselves where you view this as a chance to get authentic customer feedback that can help you guide your customer success strategy and your product roadmap, but it also becomes just a phenomenal way to get customers to tell your story. A big trend that's happening in marketing today is one of authenticity, where buyers no longer want to hear high-level messaging from a brand because, let's face it, a lot of brands say the same thing. Everybody has world-class support, everybody has wonderful ease of use and best quality. But as a buyer, it's really hard to cut through the noise. You want to know the truth, the whole truth and nothing but the truth. And so, that's the purpose that we serve— we give brands a chance to get that feedback but also put it out there. Not just on trustradius.com but on their own channels: you guys syndicate reviews from TrustRadius to your homepage and that's pretty amazing. It's a unique thing to be able to help both the buyers and the brands. Because I know for us, we do. We have it on our homepage; it's unbiased opinions. We say that we're best quality and that we're the easiest to use, and then we let our customers explain how they've come to see this product. Do they think that it's super easy? The thing that we've seen is that they've repeated a lot of the things that we've had to say, which is always cool to see. Yeah, I mean, when a buyer backs up your claims, that's extremely powerful, and buyers have a way of expressing things in a way that's just frankly more believable and trustworthy. It's in their own words, obviously, and it's on a third-party site and it's backed up, but they also talk about the cons. Let's face it — no product, especially in B-to-B, is perfect. Every product has issues and challenges, and what we've learned in our research is that buyers have a lot more trust in the pros if they see the cons. They don't want to see perfection; they want to see reality, and we believe the buyers are smart enough to kind of cut through that and understand that as long as the product is a good fit for their use case, there may be things that it isn't completely perfect at, but that's okay. That makes the content trustworthy and believable to a buyer. That, and I think also relation to your industry. For example, I can look and find a hospital in the Midwest and think, “I'm a hospital in the Midwest.” It makes it just that much closer to being able to see myself in this product. Yeah, and you know, one of the big opportunities is solving that scale problem. You're a multinational company with customers in many countries, and one of the things that you've been able to do, obviously, is to accumulate customer voices and customer stories from around the world. When someone comes to your site from Germany, they're going to see stories from German customers. We work with companies that do a lot of vertical-based marketing, and they're able to display relevant stories from the same vertical or companies who use this concept practically in sales, and they enable their sales teams to share hyper-specific, contextual examples with the buyer. And that's what buyers want — they want truth, but they also want relevant truth. Right. You were telling an example of Salesforce as being able to take the same reviews and maybe marketing with them, using them on their website, or people are just stumbling on TrustRadius when they're doing their initial searches and they're able to customize, you know. I've had a conversation with you, we talked about these points, here's, you know, a review that also talks to those points, so you can dig more into your research. In B-to-B, most products are sold, not bought. It's not like I'm deciding where to go eat pizza tonight and I Google to compare pizza parlors and two lines of text are enough to help me make a decision. Good pizza. Cheese was melted correctly. Yeah, too salty. But in B-to-B, these are considered purchases, so from a go-to-market perspective, brands don't wait for people to self-actualize. They just need a solution. Oftentimes, companies reach out proactively in advance of someone realizing they need a solution to stimulate demand. Let's say in the video conferencing world, I move offices and maybe that's an opportune moment to reach out to say, “Well, have you thought about video conferencing in your new office?” So, you're stimulating demand. We found that when you inject an authentic voice of the customer into that demand flow — whether it is an email or landing page or a social message — it lifts conversion. Similarly, most sales cycles are competitive. You're trying to differentiate yourself; you're trying to sell your advantages. And it's much more effective to back up your claims with customer evidence. And we found that sales teams that do that win more and win faster. We've done A/B tests on our landing pages, and when reviews are there, they tell a story even further and help with the conversions. We on average see about a 30 percent conversion on landing pages when you inject social proof. There's one more use case we didn't talk about, and it was one that our CEO recently did, which I thought was really interesting. So, the quarter wraps up, and usually you get an email from the CEO saying, "Hey guys, we really killed it this quarter. Great job!" But this one was, "Hey guys, we got a new review on TrustRadius. Take a look. I think it says everything." And I think it’s really powerful to be able to say that what we're doing as a company is impacting this specific customer. Yeah, you know, one of the things I try to do at my company is bring back the stories from the field, either from sales cycles, where people really get it and say, “You guys are thinking about the world very differently to everyone else” or “You nailed it.” We drink our own champagne and have our own customers write reviews on our platform, and one of the most powerful emotional things is to hear the feedback, especially when customers take the time to call out specific people. You see this in a lot of companies that provide excellent service; you see individuals being named in a review. And when you’re named in a customer review? Talk about making your day. Absolutely. So I know we're running short on time, and I wanted to see — let’s say somebody is out there thinking, “I write great reviews. I should be doing this.” How do they get involved with TrustRadius? Or maybe they're a business and they want to get involved. Yeah, we're an open site, completely free for technology buyers. All you have to do is go to trustradius.com and just look for the category or the products that you're interested in researching. If you're a brand that's interested in working with us, we're an open platform, so you just have to claim your profile and start driving your customers to our site organically at no cost to write reviews. We offer a number of premium services to help you be more effective and scale and give you the ability and the rights to use this content in your own sales and marketing channels. I encourage you to get on the journey. This is a shift that's happening in the B-to-B world — more and more buyers are looking for authentic truth before they buy, and more and more brands are waking up to this trend and realizing that this isn't just about managing your reputation online. This is about becoming a more intelligent company that listens to customers, acts upon that feedback and uses this content proactively to rid friction in sales and marketing. Kudos to your executive team for really embracing this trend and taking it very seriously. I know your entire e-team actually reads every review that comes in and takes it very seriously. Absolutely. Thank you so much for joining us. Thanks, everybody out there, for taking the time to tune in. We'll see you next week. Vinay, thank you so much.